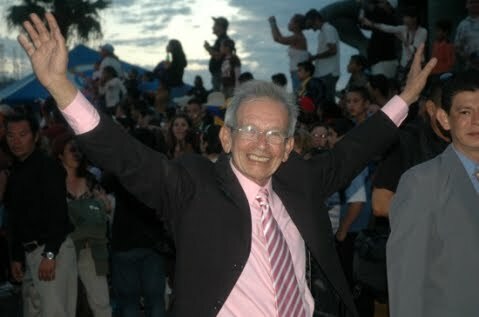 Rigo Lewis, Maestro De Carnaval | ¡VidaMaz! crownings (this one links to crowning my favorite Banda, El Recodo, King of Joy) and wonderful pre-events. 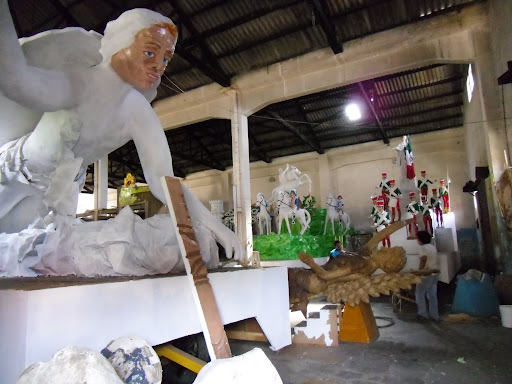 Carnavál in Mazatlán has some of, if not the best, carrozas alegóricas or floats of any Mardi Gras parade anywhere. And, the man behind most of that has been Maestro Rigoberto Lewis. This afternoon luck was with us. It’s hot out. We dropped Danny off at Scouts, and we had eaten lunch downtown. 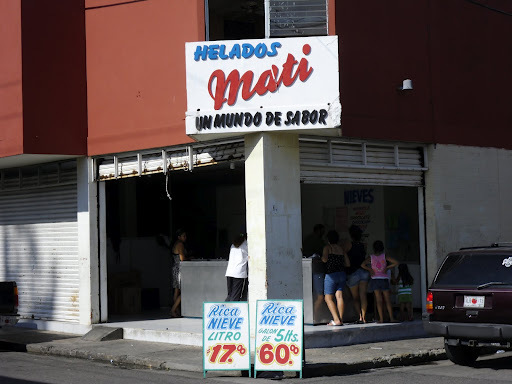 We were going to stop by Mati for a paleta. It’s a wonderful, historic ice cream maker here in town. Well, as we got out of the car to walk over to buy our paletas, we noticed a big door open to our right, and, lo and behold, carrozas alegóricas!!! We were so excited! El tallér! But, even better than that, there were a few people putting the finishing touches on the frontispiece of a statue, and who was supervising but… Maestro Lewis! 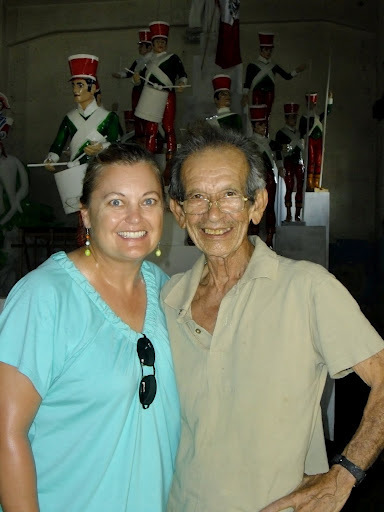 Maestro Rigo has made the carrozas for over fifty years (he started as a sophomore in high school), as well as designed most of the royal costumes (starting in 1961). He was born during a Carnavál, on February 14. He is a Valentine’s baby, but the fact that he was born during Carnaval has been a much more defining fact of his life. He very graciously invited us in. We watched them work for a bit, and then he proceeded to tell us a few stories about the plans for next week’s defile carnavalero for Independence Day, as well as his current thoughts about life. He showed us the floats he created originally for Culiacán, but which those of us here in Mazatlán will be fortunate enough to enjoy instead. He allowed Greg to take the picture of him with me that you can see above. We talked for a while, we watched, we looked around, we went across the street to buy ice cream and bring some back for Maestro Rigo and his workers, and we delighted in our good fortune. This is a photo of El Maestro that I took as he walked in the Carnavál parade No 1 earlier this year, 2010. I have some great footage of him straightening the queen’s dress as she mounts the float, too. The second parade was marred, unfortunately, by mass panic. The first parade was perfect. 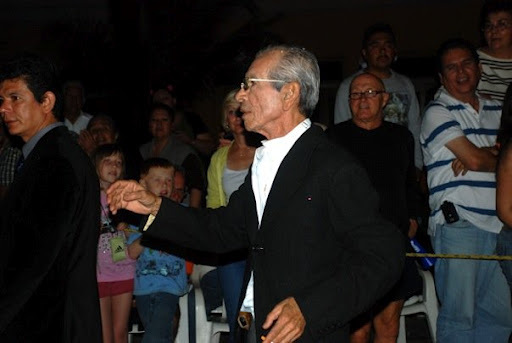 This photo of Maestro Rigoberto is taken from the Carnavál de Mazatlán site. Pingback: Carnavál de Mazatlán 2014 Final Details | ¡VidaMaz! Pingback: Día de los Muertos, Callejoneada 2014 | ¡VidaMaz! Pingback: National Recognition for Local Handicrafts | ¡VidaMaz!